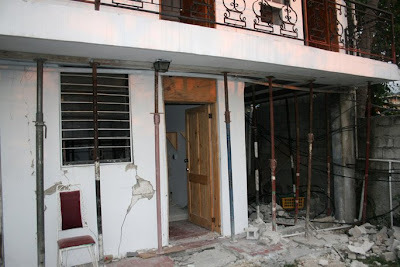 It didn't take long to start seeing the enormous destruction caused by the earthquake. Even the international airport had big cracks in the exterior walls. 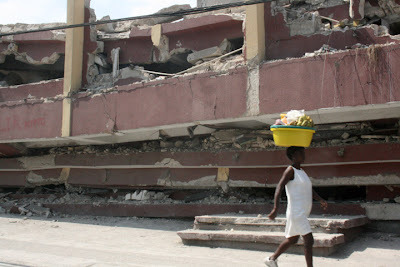 As we drove up Route de Delmas to Andre's family neighborhood, probably every third building had collapsed. Santa Cruz in 1989 after the 6.9 Loma Prieta earthquake, it didn't seem that different...just much much bigger. 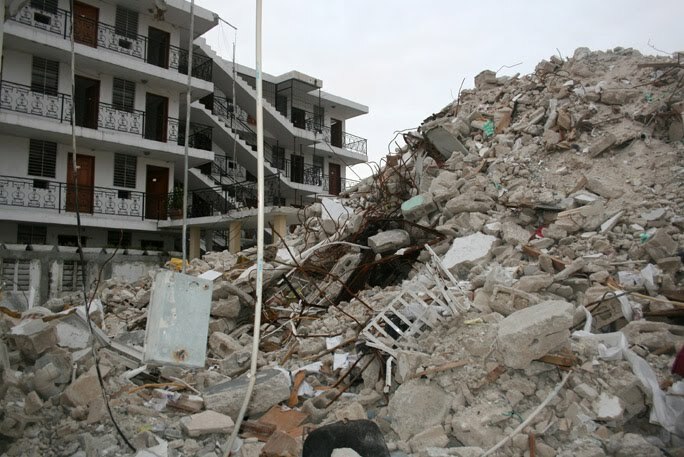 Santa Cruz, a town of 55,000 had six fatalities in our earthquake. Port-au-Prince, with its 3 million population, poor construction, and so close to the epicenter lost at least 300,000 people. I don't know how they could even begin to count them since so many are still buried under rubble. 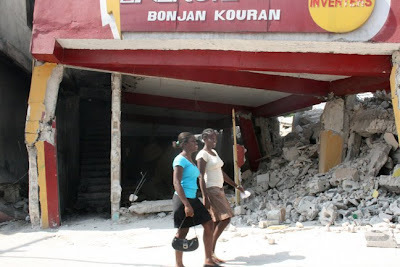 I'd also been to Port-au-Prince three times in the past three years. 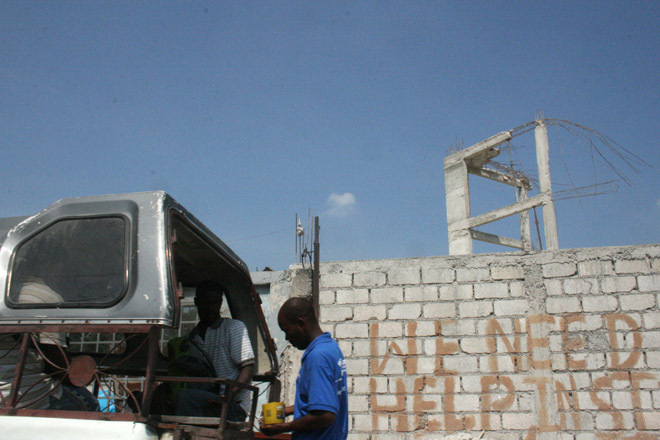 For many foreign relief workers, this was their first sight of Haiti's capitol. They were shocked that there was only electricity available a few hours a day, but that's the way it was before the earthquake. 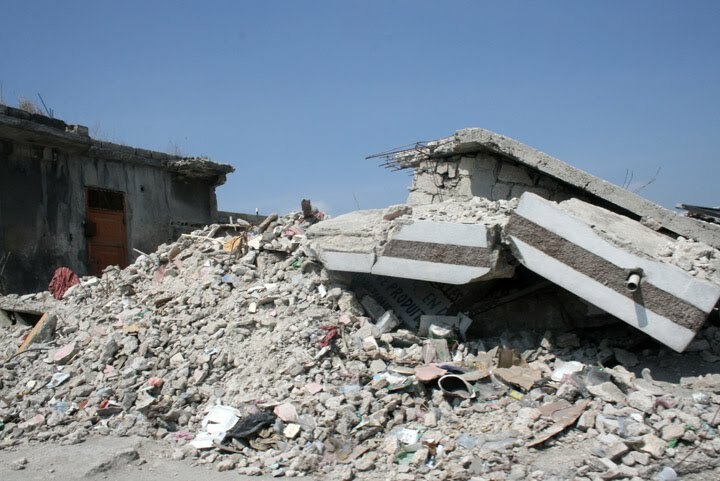 They were shocked to see people relieving themselves in the street instead of in a bathroom, but that happened all the time before the quake too. Foreigners were surprised to see so many street vendors; they assumed that was because the stores were crushed. But there were always street vendors in PAP. But like Dr. Tony Hoffman from UCSC who worked 5 weeks in Delmas with the American Relief Committee told us: you're seeing the city all cleaned up. The dead bodies under the rubble no longer smelled. He'd arrived on Feb. 15, before commercial flights were allowed into Port-au-Prince, so everyone had to go through Dominican Republic. He'd experienced more of the shock and chaos. But by the time I arrived on March 17, the aftershocks were over, the streets were cleared for traffic, the smell of death was gone, and people were going about their normal lives, almost oblivious to the rubble. In fact, I found the city to be cleaner than usual. There were way more dumpsters, and newly-employed workers in various-colored vests were sweeping up rubble and trash. No longer did you see 5 foot high piles of garbage right in the middle of the street. I was amazed how clean it was. 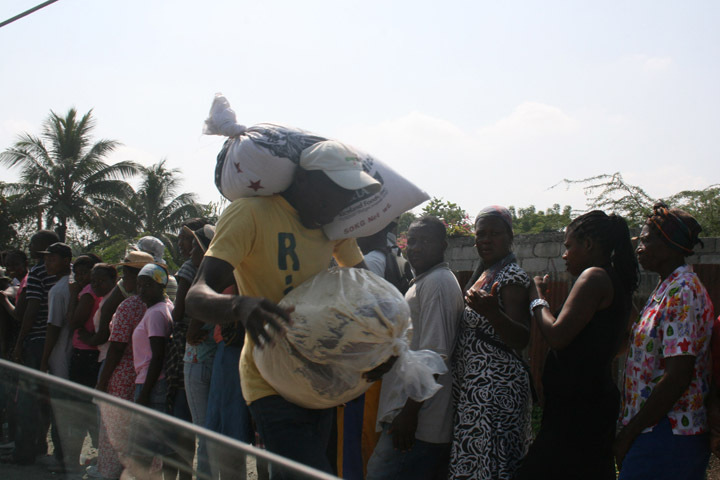 The traffic on Route de Delmas was a little bit lighter than before, despite all the SUVs of the relief workers. 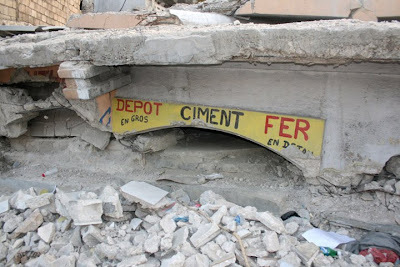 I'd heard that gasoline was even higher priced than before the quake and in short supply, but overall the main route that links downtown Port-au-Prince with upscale Petion Ville was nearly as bumper to bumper as usual. 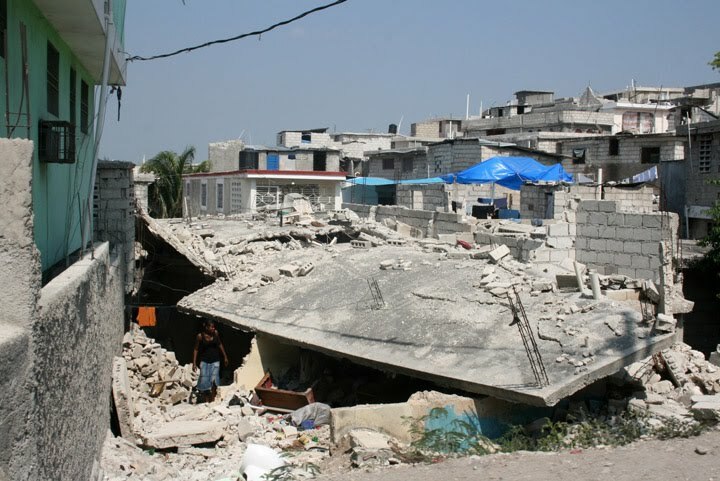 The other differences, besides all the collapsed buildings and rubble, were the tent cities and the food lines. I'd never seen that in Port-au-Prince before. I expected to see more food lines with all the millions of dollars that Americans and other countries had donated. But it seems very little aid is getting to the people. They were lining up every day, but that was to BUY water. On the rare occasion that they gave out free rice, we heard the people had to line up around 3:00 a.m., and by early afternoon they still hadn't received their bag of rice, valued at about $12 US. Only women were getting the rice coupons because they would wait patiently all day long and not get aggressive or hostile like some of the men did. We also visited the Villa Imperial Hotel where we used to pay $5 a day to use wi-fi and the pool. I asked the armed guard to take me around to the back side to see the pool. I was happy to see that it was still okay, despite the algae in the water. But the office and the restaurant were just a pile of rubble. I'm not sure how many people died there, but the owner of the hotel was one of them. I'd seen her in June 2009, directing her workers to set up new umbrellas for the patio tables. She seemed like a nice person. I remembered the painting of Obama in the lobby which I'd admired and photographed. It's under that pile of rubble somewhere. The owner's son is thinking of repairing the hotel, as evidenced by all the metal bracing they had all around the main building. I'd featured this hotel on YouTube in June 2009. A few viewers had asked me about room rates and contact information. One of those people is an EMT from New Jersey who happened to be on vacation in Haiti in January. He was able to contact me via email just days after the quake. Fortunately, he'd made reservations somewhere else after all. I saw "WE NEED HELP" painted on buildings all over the city. I wondered how they all knew to paint the same message. I never saw "Help Us" or "Please Help" or any other message. Sometimes I saw it in French or Creole. This vehicle is called a tap-tap. It's basically a small pick-up truck that has been modified to carry many passengers in back. They lift up a camper shell and put benches on each side. Two seats extend out the back and sometimes a few people stand up on the back bumper. This is the main way to get around town, besides the motorcycle taxis, which can hold 3 or 4 people easily. Andre and I did that in the villages more and used the tap-taps or got rides with his brother Johnny in his car. This smashed building used to house a cement and iron shop. 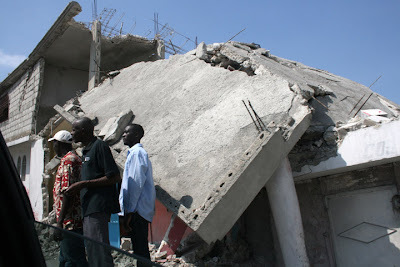 I wonder what quality of cement and iron they sold because their own building was pancaked by the quake. This is just a block from Andre's family's house, which survived with just some cracks. 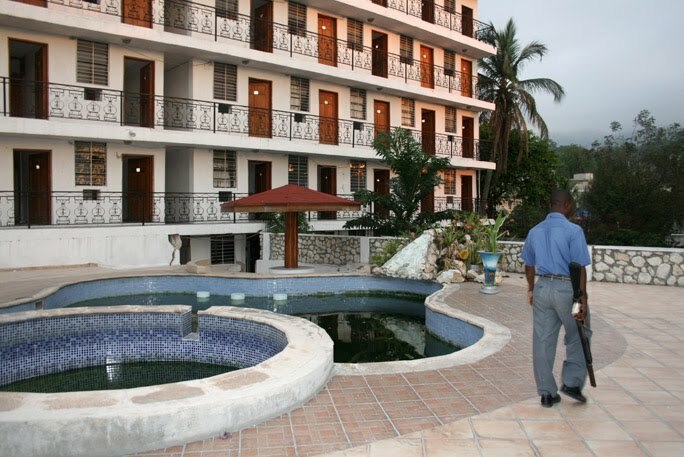 Here you see Andre and his friend Coach walking towards the Villa Imperial Hotel. 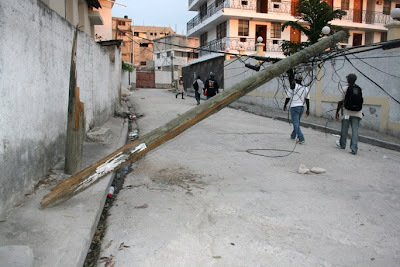 Power poles had fallen in the earthquake and two months afterwards no one had done anything with the stray electrical wires. But you'll notice how clean the street is. That's a new thing for Port-au-Prince. And no tents on this street, but just around the corner there were many. Even nice houses that hadn't had any damage would have tents out front where the people were sleeping, and probably are still.